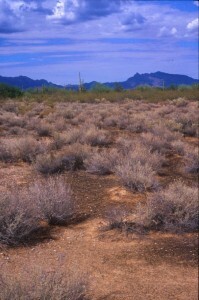 Many green algae live in terrestrial habitats such desert microbiotic crust communities. My work in arid habitats reveals that desert green algae have multiple evolutionary origins. I use traditional and molecular techniques to understand the diversity of desert green algae, and am interested in the physiological adaptations that allow these algae to survive under extreme conditions (e.g., desiccation, high light). Visit our Biotic Crust Project web site (http://pediastrum.eeb.uconn.edu/) for information on specific localities that we have studied. Note that the web site is being transitioned into a new format. Check back for updates. Selected articles on these topics are shown below. Flechtner, V.R., N. Pietrasiak and L.A. Lewis (2013) Newly revealed diversity of eukaryotic algae from wilderness areas of Joshua Tree National Park (JTNP). Monographs of the Western North American Naturalist 6: 43-63. Lewis, L.A. and F.R. Trainor (2012) Survival of Protosiphon botryoides (Chlorophyceae, Chlorophyta) from a Connecticut soil dried for 43 years. Phycologia 51: 662-665. Cardon, Z.G., D.W. Gray and L.A. Lewis (2008) The green algal underground – evolutionary secrets of desert cells. BioScience 58: 114-122. Gray, D. W., Z. G. Cardon and L. A. Lewis (2007) Photosynthetic recovery following desiccation of desert green algae (Chlorophyta) and their aquatic relatives. Plant Cell and Environment 30: 1240-1255.